My weekend went by in blur because I spent most of it working but I was still able to get a few decent workouts in. I’ve been really enjoying my (super quick) bike commutes to work. 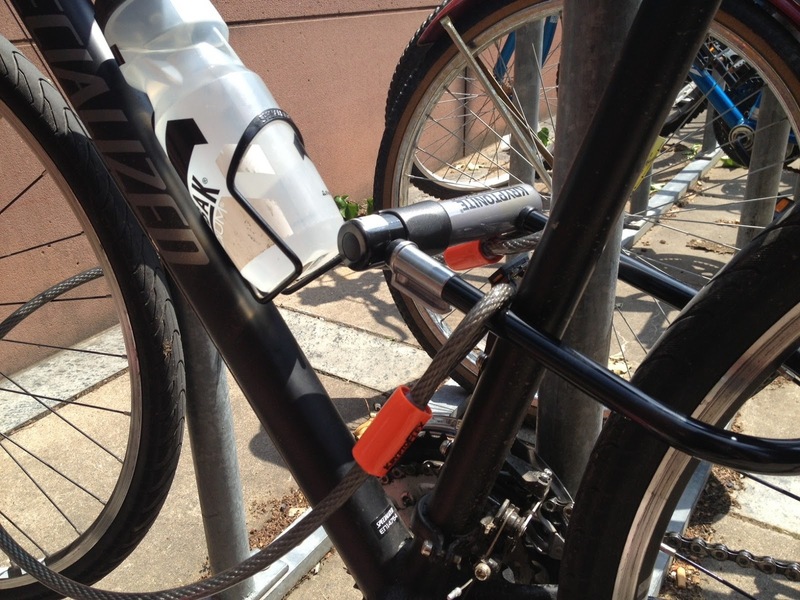 K. has requested photos of my locked up bike because he thinks I am going to accidentally end up locking it only to itself and not the bike rack. Because I may have done that in the past once.. or twice. Whoops! I shouldn’t be trusted with fancy things. Don’t worry, I remembered to take my water bottle in so no one stole it. Since I wasn’t in a rush after work on Saturday I was able to enjoy a slightly more relaxed ride home. I’m finally feeling so confident and comfortable on the bike and I am loving that. The trail is a nice way to avoid heavy traffic in the morning but riding right down the main street (which I both live and work off) really motivates me to kick it into high gear and hit some impressive speeds. I was flying, for me, at 18-20mph yesterday! Speaking of yesterday, I was so determined to get a long run in since I’m technically into my training plan for potential half + full marathons (eek!) so I set my alarm for too-early-for-a-Sunday and slowly dragged myself out of bed. I played around with the settings on my Garmin, charged my iPod because I realized it was dead and basically wasted about 30 minutes of my morning before I realized that I was going to be late for work if I didn’t get moving INSTANTLY. Due to my new zone training approach (a big, long informative post on that coming at you this week!) my long runs have been taking me way longer. Way, way, WAY longer, and I’m still not quite used to that. After a nice slow 8 miles I had about 10 minutes to stretch & shower before I had to be on the bike to work. Certainly not the most relaxing morning but definitely got my heart rate up! Today is a rest day for me, which is throwing me off. I need to move my long runs back to Saturdays so I can get back into my groove. Breakfast was boring but yummy. 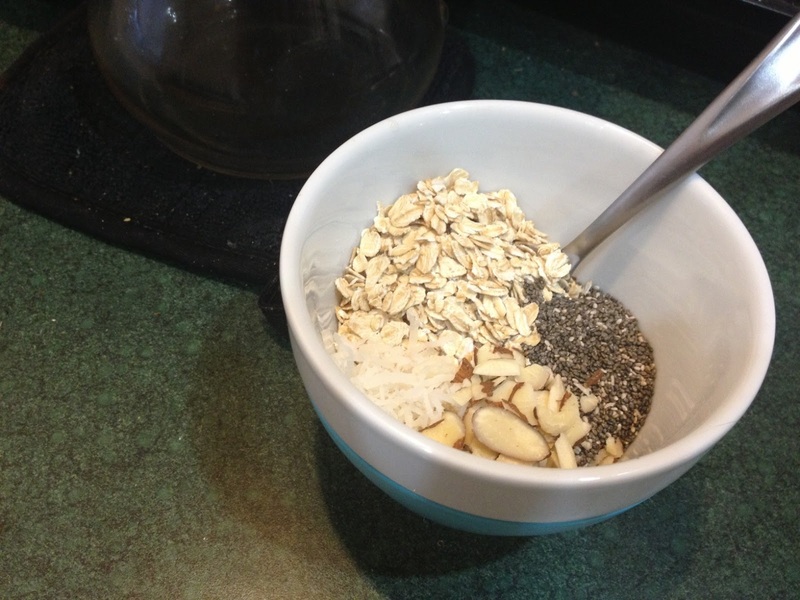 TJs honey Greek yogurt, raw oats, chia seeds, almonds and coconut. And so much coffee. Tonight we are hosting a super mini Game of Thrones finale party, which is basically just an excuse to make cupcakes. Lots of cupcakes. Can’t wait to share the pictures!